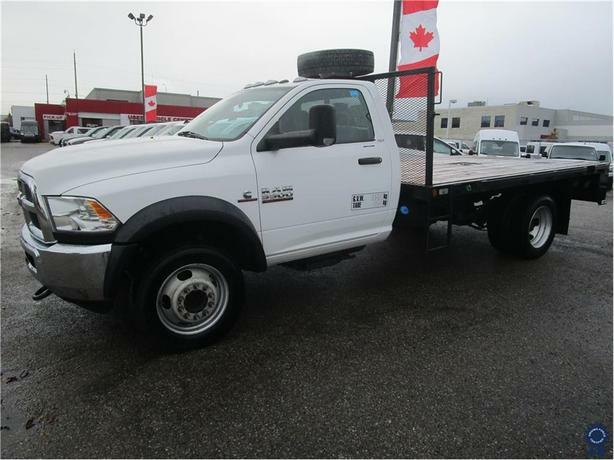 This 2017 Ram 5500 SLT Regular Cab 3 Passenger 4X4 12-Foot Flat Deck Truck comes with a 168-inch wheelbase, 84-inch cab-to-axle ratio, remote engine start, turnover 5th wheel hitch, 6-speed HD Aisin automatic transmission, keyless entry, steel wheels, chrome grille, chrome bumper, AUX upfitter switches, cloth seats, black vinyl floor covering, power windows, power mirrors, power door locks, Bluetooth hands-free calling, integrated trailer brake controller, 220-amp alternator, engine shutdown timer, upfitter electronic module, voltage monitoring auto idle-up system, 19.5-inch wheels, auto locking hubs, 120 point certification and fresh service. It also comes with a current Alberta CVIP Commercial Inspection, fresh service, 2 sets of keys, and balance of factory Dodge warranty. The GVWR rating is 19,500 lbs (8,845 kgs). The 6.7-litre Cummins I-6 Turbodiesel engine provides 325 horsepower at 2,900 RPM and 750 lb-ft of torque at 1,600 RPM. Touch base with us to discuss purchasing or financing options that are right for you and experience the difference you will only find at DRIVING FORCE Vehicle Rentals, Sales and Leasing.